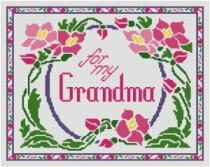 You have come to the right place for original free cross stitch charts! From one-day projects to complex designs, each pattern comes complete with lists of floss colors, stitch counts and detailed instructions explaining how to successfully complete your cross stitch project. An angel trumpets "Welcome" to the precious miracle of a newborn baby. New to cross stitch or just need a refresher? Whether you don't know quite how to begin stitching, or if you're always looking for new tips, please see our Getting Started or How to... pages. You'll find cross stitch basics, tips, and instructions for techniques you may not see elsewhere. Photos, easy-to-follow diagrams or videos accompany most tutorials. We provide our patterns in PDF format. Although it is present on most computers, if you are not familiar with Adobe Reader, please see our instructions page for how to obtain this free PDF reader. With over 30 cross stitch alphabet sets, its easy to find the perfect one to personalize your cross stitch pieces. Italic letters, letters with serifs, outline letters, candy cane letters, even letters that remind you of cotton candy or curling ribbon! Every cross stitch alphabet has usable, readable letters that include letters, numbers and punctuation. Line alphabets - constructed entirely with backstitches. Block alphabets - made with full and partial cross stitches. Graphic alphabets - graphic images are intertwined with the individual characters. Click here to see over 30 free Cross Stitch Alphabet Designs. 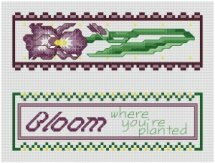 Cross Stitch Border "Forever Tulips"
It's becoming more and more popular to cross stitch a favorite verse or saying, and cross stitch borders give you a way to turn those words into finished cross stitch designs. Our borders feature elements that make it easy to change the size, the color and even the layout to create truly unique work of arts. Keep watching as we add more patterns to our newest category of free cross stitch designs. 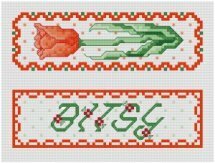 Click here to see our Free Cross Stitch Border Patterns. Cross stitchers are among the most generous people I know, often giving away their most prized projects. Know someone who loves to read? A personalized cross stitch bookmark is the perfect gift. You'll be remembered every time they pick up their favorite book. Nothing sends we cross stitchers to the store faster than news of a new baby on the way. Blankets, bibs, booties aren't complete without brightly-colored images that please Mom and Dad and delight the wee ones. You'll find over 30 cross stitch designs for baby and toddlers. Because each is stitched inside a heart, it is easy to mix and match. Click here to see afghan layouts and what inspired these brightly-stitched heart designs. From bookmarks to birth records, Christmas ornaments and art you can frame, Christian themes characterize these intricate designs. 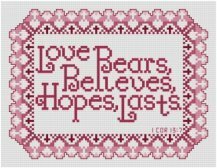 Click here to see additional Free Christian Cross Stitch designs. Click here to see Christian Christmas Ornament designs. 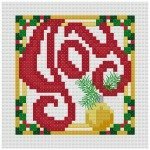 These Christmas cross stitch designs can be used as ornaments, to decorate table runners, napkins, towels . . . the list is limited only by our imagination. Cross stitch alphabets send your Christmas messages! Don't just look at the alphabets that have Christmas-y names. With the right colors and a special touch here and there, you can make lots of alphabets fit your Christmas theme. 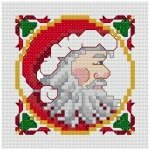 Cross Stitch Alphabet 10 - "Curling Ribbon"
Cross Stitch Alphabet 28 - "Santa"
Cross Stitch Alphabet 24 - "Holiday"
Is anyone busier than a mother (or a grandmother)? 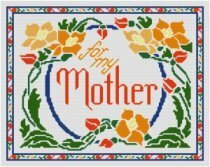 In her honor, this pattern offers a design using a technique called Count-less cross stitch. Doing minimal counting and working in a single color within large blocks, you have fewer color changes. Yet the result is similar to Tiffany glass. Weddings, Anniversaries, Valentine Day, Love any day! Love bears all things, believes all things, hopes all things, endures all things. Love never fails." Life is too short not to tell loved ones how we feel. Don't wait for a special day on the calendar. Personalize this birth record once the new baby is born using one of our cross stitch alphabets. Or use the angel design as a template for your own favorite verse. I have to admit this is one of my favorite cross stitch designs . . . originally stitched in graduating shades of pink, I liked it so much that I charted it in teal, too! I prefer to think of it as dedication. You know what I mean. You just have to keep your fingers moving. The more you stitch, the more beautiful projects you have to share with others. Give a wry nod to your hobby with this "Addicted to Cross Stitch -- My Bear to Cross" cross stitch design. Can't find the design you want? I received touching emails from two different women. Both had a friends that recently lost a baby. 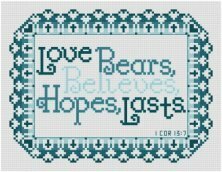 One wanted to customize "Love Lasts" design with the baby's name, for love truly "bears, believes, hopes, lasts." Another customized the center of the design above. It was comforting to visualize Angels welcoming the little one to her heavenly home. Both were beautiful and unexpected way to use these designs. 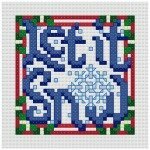 If you are unable to find the perfect cross stitch pattern for your situation, look for one that is almost perfect. Then imagine how you can change the design to fit your needs. Browse through other pattern categories. For example, the sentiment "Hope" is relevant in many situations other than just at Christmas. 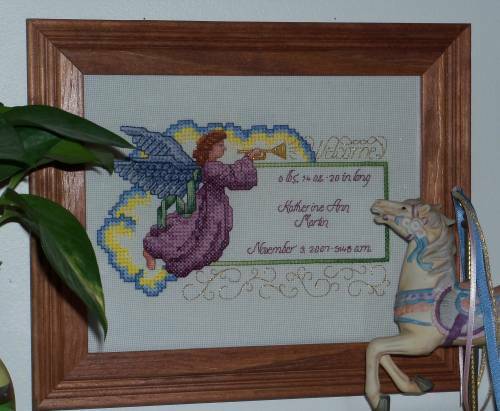 Find a border pattern you like, a cross stitch alphabet that fits, stitch a favorite verse, and you have a unique and personal cross stitch gift that loved ones will cherish. That's the the beauty of counted cross stitch--every pattern is made up of a bunch of little squares. Try it and you might surprise yourself! Check back to see when new free cross stitch charts are posted or subscribe to our blog to be notified automatically.